Breadsticks (grissini) are generally pencil-sized sticks of crispy, dry bread originating in Turin and the surrounding area in Italy. They are originally thought to have been created in the 14th century. They are considered to be Spanish and Italians favourite bread. Left: Grissini in a basket. The original recipe, grissino torinese (as still made in Turin), differs from the modern version in that it is thicker, longer, hand-made, often twisted and has a more bread-like texture. Toppings vary from simple coarse salt to seeds or dried herbs of your choice. The most popular variations are named grissino stirato (straight) and grissino rubatà (hand-rolled). They are often placed on the table in restaurants as an appetizer, although they are usually larger than pencil-sized. They can also be combined with more luxurious ingredients such as Prosciutto to form an hors d'œuvre. 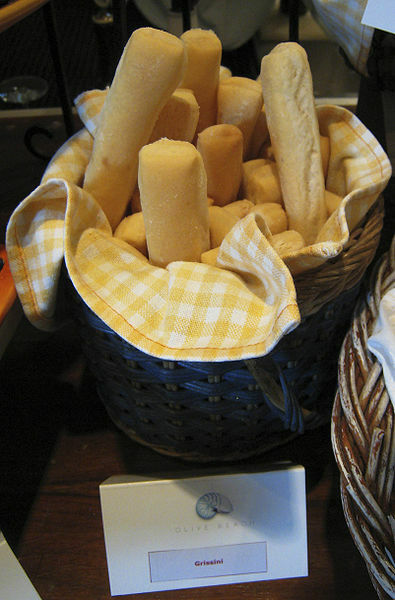 Regions that consume breadsticks include the Americas, Europe (mainly Spain and Italy), Australia, and parts of Asia.